Walking and talking in nature. On his first night of his job, he's contacted by his new boss, Delilah, over the radio. Without hesitation, she confronts him: "So what's wrong with you?" she asks him in a drunken stupor. Everyone who comes here has something to hide. But any sense of security read from her patronizing tone is also a veneer. Delilah, despite her witty postures, is also looking to escape from something. What is it about the Wyoming wilderness that draws people who need to get rid of their pasts? I played as Henry, completing tasks assigned by Delilah. Calling them "tasks" doesn't do it justice though; everything I did in Firewatch was purposeful and deliberately woven into its short narrative arc. Tasks generally correspond to points on the map, meaning the primary thing I did in Firewatch was walk. Probably 90% of Firewatch is walking, travelling the area, becoming intimately familiar with the setting. Two Forks is pretty and positively alluring in all four of its dusk-to-night times. The shadows projected by the trees and foliage have a weighty presence, and in denser areas, the light that penetrates the trees make the shadows appear fine and granular, creating striking and intricate scenes. Light is what really makes Firewatch's ordinary setting feel extraordinary, as my near 70 screenshots taken during a playthrough hopefully demonstrates. But what really gets me jumping is the game's environmental design. To say Two Forks feels 'natural' wouldn't be enough; there are so many little variations in its heightmapping, you're almost never walking on a flat surface and nowhere does the landscape feel artificial. The use of lakes to separate important areas, the use of large boulders as reference to split roads and landmark areas is smart but never obvious. Trails split off unpredictably but you can always trace your way back. The game somehow achieves at both embodying an unpredictable wilderness and being reasonably navigable. The use of materials: rock, soil, grass, and bush around the trails, not to mention the different species of trees, is so diverse, but areas never appear messy or recklessly painted. 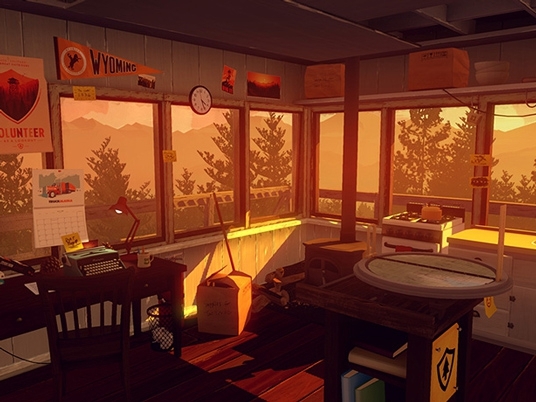 What Campo Santo's environment artist Jane Ng does with Firewatch is no short of masterful. The nuances of realist environment design have never felt so tangible to me, and so powerful, completely unrestrained by bloated and congested AAA mechanics. As far as I'm concerned the work that she's done here is award-worthy. 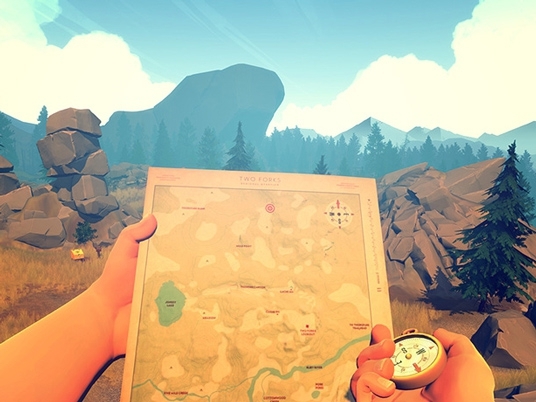 Firewatch's world isn't very large because the point is to learn the area and become familiar with it. I used a diagetic map and a compass to find my way around. By default, there’s an option to show your location on the map, but I rarely felt as though I was losing any sense of discovery, or the satisfying challenge of navigation. As I explored Two Forks, I had plenty of conversations with Delilah over the radio. There are lots of objects and landmarks that allowed me to call Delilah for her input, always prompting an entertaining conversation. Sometimes, Delilah will call for no reason other than her own own boredom. After so much talking, I learned quite a bit about the two. Henry has a good sense of humor, but he's also quite reserved; it's clear there are questions regarding his true purpose for being in Wyoming. He’s not ready to answer those tough questions about abandoning Colorado and his old life. Delilah, by comparison, is much more open. She's a mostly competent boss and a skilled decision maker, but she easily loses her composure when the game enters its central complication, and it's Henry's persistence and self-control that allows him to resolve the game's plot. They compensate for each other's flaws and mistakes, perhaps in a typically hetero way, but the relationship is nuanced and I enjoyed engaging with them as characters. It's clear as the game progresses how much they rely on each other, and how their insecurities may not be so incompatible after all. And what makes them so admirable are the ways they express empathy not only for other, but for those caught in the situation at hand. Firewatch's central "dilemma" turns the game into somewhat of a mystery story, and while it's entertaining, the spookiness of it all can clash a bit with the hard realism of its general set up. I was also a little disappointed at how eager the game was to answer so many of its questions by the conclusion. I would have preferred if some of the more important ones were left unanswered for me to reflect on. Regardless, I think the game leaves with as much strength as it enters, and its central themes are never left in the dust. The clutch of Firewatch to me, the thing that makes this game so hard not to respect, is complete and utter devotion to its fiction. Its scope is so narrow and its area of focus so specific, it really is literary realism at its finest. Firewatch is unarguably an achievement, and I completely recommend the experience.